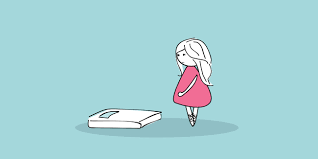 Bulimia nervosa is a serious, potentially life-threatening eating disorder characterized by a cycle of binging and compensatory behaviors such as self-induced vomiting designed to undo or compensate for the effects of binge eating. * Regular intake of large amounts of food accompanied by a sense of loss of control over eating behavior. * Regular use of inappropriate compensatory behaviors such as self-induced vomiting, laxative or diuretic abuse, fasting, and/or obsessive or compulsive exercise. * Extreme concern with body weight and shape. The chance for recovery increases the earlier bulimia nervosa is detected. ​Therefore, it is important to be aware of some of the warning signs of bulimia nervosa. -- Evidence of binge eating, including disappearance of large amounts of food in short periods of time or finding wrappers and containers indicating the consumption of large amounts of food. -- Evidence of purging behaviors, including frequent trips to the bathroom after meals, signs and/or smells of vomiting, presence of wrappers or packages of laxatives or diuretics. -- Excessive, rigid exercise regimen--despite weather, fatigue, illness, or injury, the compulsive need to “burn off” calories taken in. -- Unusual swelling of the cheeks or jaw area. -- Calluses on the back of the hands and knuckles from self-induced vomiting. -- Discoloration or staining of the teeth. -- Creation of lifestyle schedules or rituals to make time for binge-and-purge sessions. -- Withdrawal from usual friends and activities. -- In general, behaviors and attitudes indicating that weight loss, dieting, and control of food are becoming primary concerns. -- Continued exercise despite injury; overuse injuries.